What is the Gifts by Group Report? 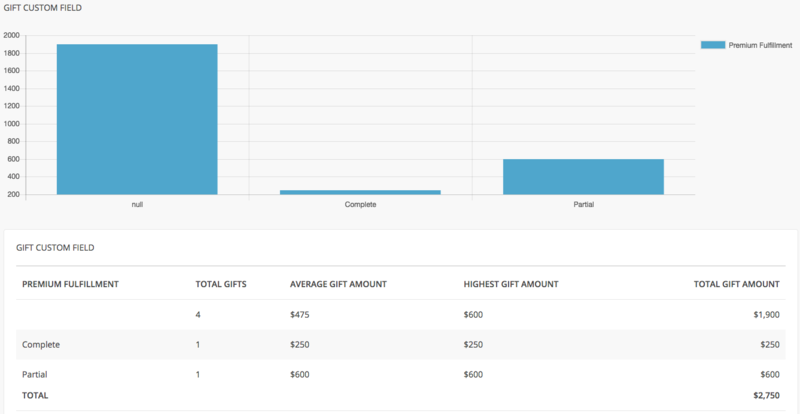 The Gifts by Group report allows users to create a report of all Gifts within a specified period of time broken down by values entered in custom fields at the Gift level. These reports will allow for quick views of giving data that incorporate specific data defined by and tailored to the needs of your organization. For example, an organization may wish to track premium fulfillment at the Gift level, to keep a record of which Premium items have been shipped and which have not. This can be tracked at the Gift level with a custom field called "Premium Fulfillment," which may have several possible values, including "Fulfilled," "On Order," and "Partial." Using the Gifts by Group report, that organization could quickly report on giving broken down by Premium Fulfillment status, and see how many Gifts have Premiums that still need to be sent, and how many are complete.